Discussion in 'Introductions' started by Lenabarce, Jan 28, 2019. I have a 8 1/2 month old Male XL American Bully x Am Staff mix and I feel he is small for his age considering both his parents are quite big. His Dad is an XL Am Bully, UKC registered purple ribbion (not to sure what that means) and I was told his Mom is an American Staffordshire Terrior. I’m just wondering if there is anyone out there who could take a look at the pictures and tell me if he is on the smaller side or if he will potentially be as big as the parents. he is handsome! sorry, i cant answer your question. Welcome! Love the markings on these dogs! He appears to be mostly American Staffordshire Terrier with that "mix". He appears to be pretty good sized from just the pics. What does he weigh now? He weighs 73 pounds now and will be 9 months on feb 6th. He is a good size for sure but his head and body seem much smaller than his parents and I was kind of doubting that he would get much bigger. I know that he will fill out over the next couple years but again he just seems small to me so I thought I would seek others opinions. He looks pretty big to me and will be in the 80 pound range at maturity. That's about as big as an Am Staf wants to be! Size can be variable and just because parents are big doesn't mean all the pups will be. If there is something mixed in there, size becomes even more variable. Rambo is a good looking pup. If you thought he had some American Bulldog in him, I'd agree. He's probably close to his adult height now but will continue to fill out with bone and muscle till 3 years. Thank you! 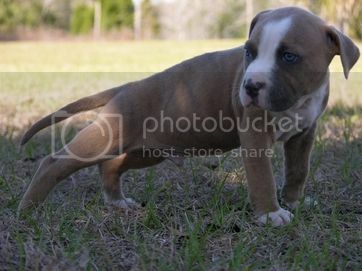 He is super cute And your right, I often wondered if he has some Am bulldog because as you can see his father does not look like your typical pure American Bully although the breeder does have him registered as an APBT thats is considered XL American bully with bloodlines. The whole thing confuses me. And then he told me the Mom is an Am Staff and she is 90 pounds and appears to have bully in her as well. I just thought I would show some pictures and get some second opinions. I know he will fill out over the next two years but i wonder how much or if his head will grow to be as big has his parents.